You may be wondering how someone can draw in air. Its actually possible through a 3D Stereoscopic Printing Pen toy. When the pen is operated through a button it emits slightly melted plastic through which you can draw a plastic made horizontal as well as vertical line in air (3 dimensional). Any ordinary pen can draw a horizontal line on any type of flat surface but with this Stereoscopic Printing Pen its even possible to draw a vertical line in air (3D). That is the reason I said it can draw in air. First of all just hold the pen at the point (on the surface) where you want to draw a plastic made vertical line (in 3d) and than slightly start raising the pen above in air from that point. Make sure the pen is emitting the melted plastic (pen is in on mode ) during this process. As you raise the pen from ground level in a vertical direction, a plastic made vertical line in air will start forming but you need to do it slowly. The melted plastic solidify (as temperature is lower outside the pen) as it comes out of the pen and as a result this plastic doesn’t fall back on the ground as one layer of plastic comes over another layer and solidify itself on the previous layer. Its hard for this vertical plastic line to stand on ground, so first its better to draw a horizontal plastic line and on top of it start making the 3d vertical plastic line as its easier for plastic to get attached with another melted plastic. This way various 3 dimensional figures can be created like a cube or a box or anything else. Just watch this cool video and you will know what I am talking about. Its a great product for arts and crafts work. Arts and crafts students are making great use of it. This is rather an unusual pen toy which operates through heating of thermoplastics. Actually thermoplastics like ABS and PLA become soft and moldable when heated and return to a solid state when cooled. This basic concept is being utilized by this wonderful pen. When you buy this pen, thin plastic filaments (thin plastic wires) are supplied along with it. Additional filament supplies can also be ordered if you have already utilized all the older ones. There is a small hole at the top of the pen through which the plastic filament is inserted into the pen. 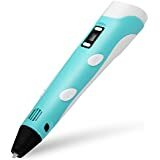 The nozzle through which the pen emits plastic ink gets heated up (max 230 degree) quickly and so you should not touch it while using the pen. There are two specific buttons for loading (feeding) and unloading the plastic filament from and into the pen. After use you must unload the left over filament else it may get solidify within the pen. There is also a button to control the speed at which the melted filament is being thrown out of the nozzle. There is also a LED screen to check with the lights. The pen is also quite sturdy and robust. A power adapter is also provided along with the pen. Just pin the one end of the power adapter to the pen itself, and other to the current source, and you are ready for go once yellow light comes on the LED screen. Now just tap the feeding filament button and you will see a green light on LED screen indicating that the unit is warming up. Once green light appears its time to insert the plastic filament by holding the feeding button. Then just start using this awesome product to create three dimensional figures by keep pressing and holding the feeding button again. But you need to work hard to master this art. These are also available in different colors. Just check below picture and you will see how a 3 dimensional cycle has been created using this pen. If you are in UK you can buy this pen on Amazon.co.uk. If you need in wholesale price buy on chinavasion.com. There is also a product called Tobar Magic Sand with which one can draw 3d pictures inside water instead of air. This human figure puppet will let you to draw pictures in different poses and animate different characters with great ease. This cutting machine tool will help kids to cut different designs out of a sheet of paper or fabric using the software provided.